← Can you say “Groupon” in Spanish? Concern over corruption has surged in India in recent months. Although corruption is nothing new to most Indians, a series of recent high-profile scandals have been particularly galling. These include a multi-billion dollar alleged telecoms scam, alleged financial malpractices in connection with the 2010 Commonwealth Games in Delhi, and allegations that funding of houses for war widows was diverted to civil servants. Anna Hazare, an influential social activist, has launched a hunger strike to urge the government to pass a new law that would create an anti-corruption ombudsman. Meanwhile, 5th Pillar, an NGO, has been advancing a campaign to publicize the fight against corruption by distributing “zero rupee” notes, which are graced with the portrait of Mahatma Ghandi and resemble 1,000-rupee notes. The idea is that people or businesses can offer zero-rupee notes when solicited for bribes by local officials. (As an aside, a friend and colleague has produced a short film which shows the zero-rupee note concept in action. It’s well worth viewing and you can find it on Youtube). Will the anti-corruption efforts in India bring about change? If so, will change require a few years, or a few generations? Or is corruption so endemic that fighting it is counterproductive? Perhaps the best approach is to simply manage how it happens? These are tough questions to answer, but I will offer a few suggestions, based on analysis of 10 years of data from Transparency International’s Corruption Perceptions Index (CPI). The CPI is an amalgamation of annual surveys that ask local academics and businesspeople around the world how they feel about corruption in their countries. The surveys are comprehensive, addressing everything from petty street corruption to shadowy campaign-finance practices. Transparency International aggregates the survey data and ultimately grades countries on a score of 1 to 10, with “10” implying the least corruption. Given the dramatic economic growth of emerging markets over the last 10 years, one might expect to see a decline in corruption in many countries. As countries become richer, they should be able to pay better salaries to officials, thereby reducing the need for extra-legal income (i.e., bribes). Also, it stands to reason that high-growth countries would owe some of their growth to achievement of greater transparency in their economies. The data suggests this is true… except when it is not. Some countries have indeed become less corrupt (India is one of them, improving from 2.7 in 2001 to 3.3. in 2010). But corruption has worsened in many countries. And in others, there has been little change. Among these is China, which was graded at 3.3 in both 2001 and 2010. Below is a chart showing the CPI scores over the last five years for ~30 of the largest emerging markets (I’ve also thrown in a few “developed” countries for comparison. These are highlighted in yellow). Also, the four “BRICs” are highlighted in blue. 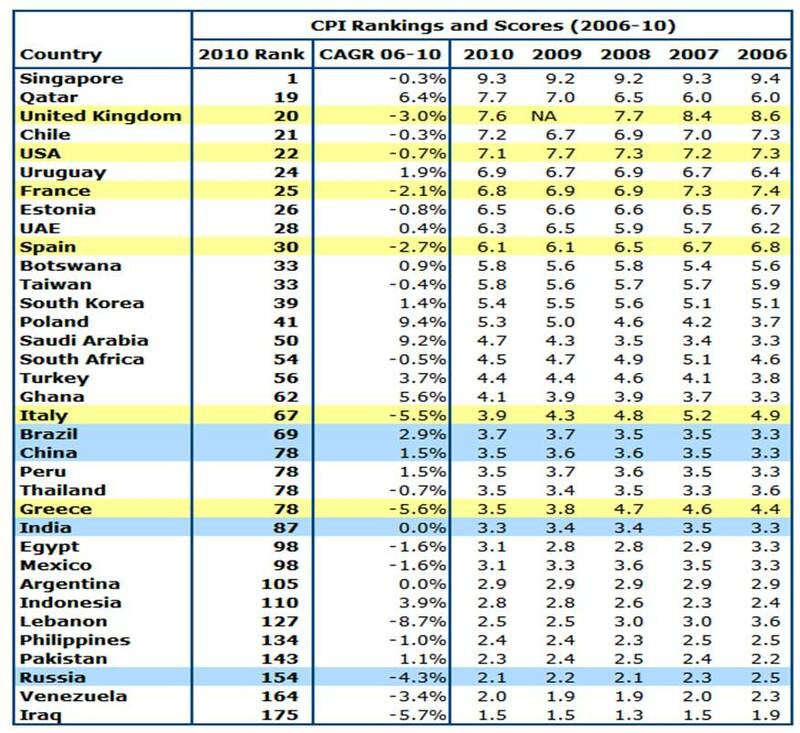 The table shows only a few emerging markets figure among the transparency elite (congratulations to Chile and Qatar). The data also contain indications of which countries are becoming more or less corrupt (or neither). These numbers are very helpful for thinking about the future development of emerging markets. If a country is not improving its transparency, it will have more difficultly maintaining steady growth. In my next post, I will review some of the key trends I observe in each of the emerging market regions (Eastern Europe, Africa, South Asia, East Asia, Latin America). The findings are interesting, suggesting different trends within countries in the same region. Some countries appear headed in different directions. The data also helps understand why some countries have responded better (or worse) to recent shocks such as the global recession of 2008-09 and the wave of uprisings in the Middle East. This entry was posted in Africa, Asia-Pacific, Europe, Latin America, Market Analysis, Middle East, South Asia and tagged Analytics, BRICs, Corruption, India, Transparency International. Bookmark the permalink. 4 Responses to Psst… care for a zero-rupee note? I read your blog and really liked it. It presents a balanced point of view regarding the issue. 1. While the big corruption scandals affect the business environment and the tax payers (only a small % of Indians pay taxes) and the country at large, the initiatives like the “zero rupee note” or our film are trying to highlight the social issue around corruption that affects the common man. The issue is that corruption is getting institutionalized both in every day business dealings and even accepted at homes. That is the scary part. So while media will always focus on the juicy stories involving politicians and big name industrialists, there is a grass root level awareness and moral campaign that is required. Anna Hazare is trying to start at the top and drive accountability top-down into the system. 2. Media is quoting inflated numbers in the 2G corruption scandal because they dont know any better and they want to sensationalize and for that objective – the bigger number is a better number. The truth of the matter is that new operators were given spectrum at 10 year old spectrum prices, which was a $40Bn opportunity cost for the goverment (at 2010 prices). The (supposed) rationale was that new entrants should have an opportunity to competing against incumbents who have deep pockets, and charging market price would make the business case for the new entrants very weak. But media/most people believe that the bribes of $40Bn changed hands, but thats a huge exaggeration. Lastly, thanks for including the link for my video. Once again, great post! Keep up the good work! This is some truly insightful stuff here. I’m going to be looking to your blog in a few days when I have to do my market forecasts for the BRICs. Along those lines, how familiar are you with the business environment in the former Soivet Bloc countries? I’m hoping to get as much granularity there as I can without hopping on the next plane to Prague!!! Hi Mike, Glad you liked the article! The Economist had a great article on corruption in eastern europe a couple of weeks ago (http://www.economist.com/node/18560605?story_id=18560605). You should also check out the World Bank’s Ease of Doing Business rankings, and the WSJ/Heritage Economic Freedom Index. Both will give you some good data to that end… I find article searches of the Economist and maybe WSJ or FT good for the qualitative context. Hope that helps!